Apple's new iTunes 11 is finally ready for download. Apple made the announcement via its iTunes page Thursday, confirming an earlier report that the music would indeed rain down on us in a matter of hours. The new tune turner was due out before the end of the month, and the Nov. 29 seems to be just about as close to the end as Cupertino could cut it. Originally slated for an October release, Apple held off on breaking out the new 'Tunes to "get it right." It looks like the fruity folk finally got the service where it needed to be. 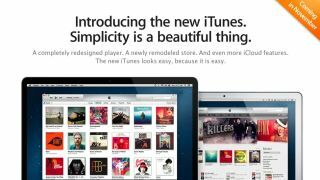 Apple is calling iTunes 11 "a redesigned player," something we've never seen or used before. New library views that facilitate smarter, more intuitive searches and a new MiniPlayer that's jammed with more features are part of the package. The update also features expanded views for more in depth searches (want to know every song on an album? ), preview history to help users return to previous searches more quickly and a new storefront that, in Apple's words, perfectly in tune - with you. iTunes 11 also features greater iCloud integration. Whenever users buy an album, song, movie or TV on any device, it become instantly available in the iTunes library on either a Mac or PC. iCloud also lets users pick up where they left off - whether it's a movie, song, TV show podcast or whatever it is you're streaming on iTunes. All in all, this is a sleek redesign that turns Tunes into quite a hip looking hub. Now let's see how users like it.